Here, then, is the strange, hidden story of Harley Quinn, the superhero world’s most successful woman — who she is and how she came to be. 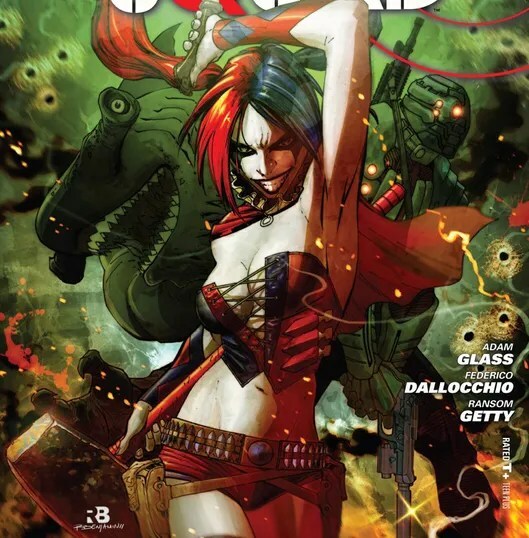 Writer Paul Dini is credited as the creator of Harley, and that’s technically true. He came up with the character while he was writing for the acclaimed Batman: The Animated Series in the early ’90s. But the true origins of Harley Quinn lie years earlier, in the mind of the actress who voiced her on the cartoon: Arleen Sorkin. Dini and Sorkin were college friends, and one day, she gave him a VHS tape of her favorite Days moments — including her jester bit. The tape sat idle for years. But in mid 1991, Dini was sick as a dog and popped the tape into his VCR. He was a budding television writer at the time, cranking out freelance scripts for the as-yet-unaired Batman: The Animated Series. He’d been struggling to come up with a female character to use as a one-off in an episode about Batman’s archnemesis, the Joker.”I thought, Maybe there should be a girl there,” he said. “And I thought, Should the girl be like a tough street thug? Or like a hench-person or something? And then suddenly the idea of someone funny kind of struck me.” When he saw Sorkin in clown makeup, the pieces fell into place, and he came up with a silly little sidekick. He gave her the comic-book-y name of Harley Quinn, sketched out an idea for her look, and brought the sketch to the cartoon’s lead artist, Bruce Timm. “He did do a rough design for her, which was, frankly, not very good,” Timm recalled. “It had a weird ’60s kind of vibe to it. It was just odd. Charming, but odd. I thought we could improve on that. So I immediately started researching traditional harlequin gear and did kind of a simplified super-villain version of that. It was always intended to be just a one-off.” Nevertheless, Timm was — and is — a perfectionist and labored to give this cameo character a distinctive look: a red-and-black full-body jumpsuit adorned with playing-card diamonds, ruffled cuffs, and a dual-pronged jester’s cap. The game changer was a concise tale called Mad Love. By 1994, Harley fever had caught on, and DC’s comics arm asked Dini and Timm to create a single-issue comics story that would reveal Harley’s origin story. 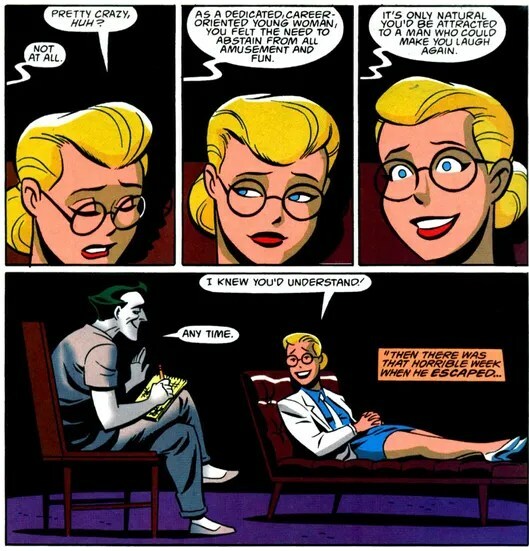 We’d already gotten hints that Harley had once been Joker’s psychiatrist, but in “Mad Love” we fully saw her early days as mild-mannered Harleen Quinzel, gymnast and aspiring mental-health professional. Looking to write a pop-psychology book about the Joker, she falls for him and decides (of her own volition) to become his sidekick. 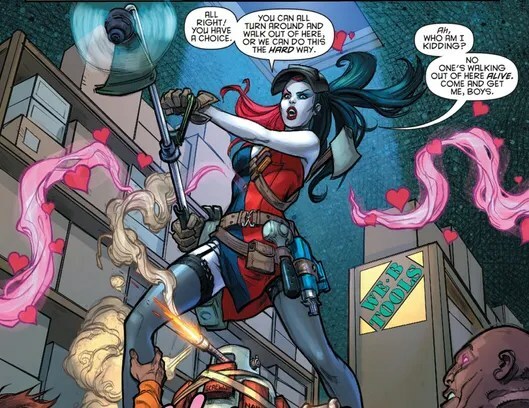 Mad Love was a massive hit, winning an Eisner (the comics’ world’s Academy Award) for the year’s best single issue and convincing DC that Harley was a marketable property. Soon Harley was a regular in The Batman Adventures, a comics series set in the universe of The Animated Series. And finally, after years of cartoonish popularity, DC made her a canonical character in the primary Batman comics continuity in 1999. Such continuity is treated with great care, and if a character created outside of it is allowed to enter, it’s no small creative achievement. What went wrong? Comics essayist and Batman historian Chris Sims offers a theory. “When you move her into mainstream continuity in 1999, it immediately changes things, because she’s in love with the Joker we have in the comics, not the one in the cartoon,” he told me. “And comics Joker has killed a million people. He’s a sadistic, torturing murderer. You can’t sympathize with her when that’s the Joker she likes.” On the other hand, if you move her away from the Joker, you remove her defining relationship. It would be like writing years’ worth of Joker stories that didn’t involve Batman: empty and confusing. Then, out of nowhere, Harley’s salvation came from far outside the pages of monthly comics. It was a mixed blessing, as that salvation also set an extremely controversial new template for Harley Quinn, one that would pit fan against publisher as it rocketed the character to her greatest heights of fame to date. “It’s that classic idea of ‘show us as much skin as possible because it’ll bring in those teenage boys,'” said Laura Hornack, a Harley Quinn superfan from Germany. She launched an online campaign attacking the visual change and even went so far as to organize a protest at 2011’s San Diego Comic-Con. Turnout wasn’t great, but she wasn’t alone in her skepticism about the character’s direction.